Store multiple cards along with your ID and money in this faux leather wallet. 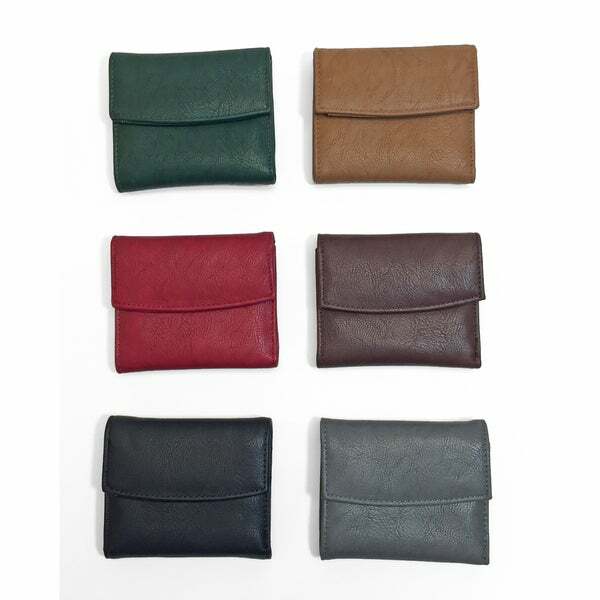 A tri-fold design makes the wallet compact to fit well in small purses. The wallet includes a section for paper money, four card slots, a clear ID spot, and a zippered coin purse for organized use. This is a simple wallet. I got the green and it's true to color. It does exactly what I want without all the extra pockets and zippers that make many wallets bulky and feel more like another purse. The size is perfect and I can drop this wallet into my evening bag just as easily as I can a larger purse without having to pluck what I need and throw it loosely into a pocket or change everything over into a more practical wallet. I've had it a couple of months, use it exclusively, and it's showing no signs of wear. Very happy with this purchase. This for the price is a nice little wallet for a small purse. I loved this little wallet. Great quality and very good value. I purchased this as a gift and I will definitely be buying several later this year to gift to more family and friends. Nice wallet. I bought it for my teenager for Christmas. She approved which was a miracle. She is extremely picky about her accessories and does not like most wallets. As soon as as I unzipped the change pocket and zipped it back up, the pull part of the zipper came completely off the end. I tried unsuccessfully several times to get it back on but it never worked. "How many credit cards does this hold?"